Poker can be a card game that seems complex to the untrained player, but is actually straight forward once you get the gist. Most players pick up this beloved game easily and can’t wait to learn the many variations. There is a reason why poker is largely considered the world’s favourite card game; it’s fun, exciting and requires the perfect blend of luck and strategy. In order to get your head around poker, it’ll help to understand these basic terms generally found in all variations of the game, along with the ample diverse variations. Fold – You always have the option to lay down your hand which takes you out of the pot for that round – you forfeit any chips placed during the betting rounds. Check – You stay in the hand, but opt not to place a bet. This can only be done if no one else has placed a bet before you. If a player has already placed a bet, you cannot check, but can still fold. Call – Here you choose to match the bet (put down the same amount of chips) as the player betting before you. This keeps you in the hand. 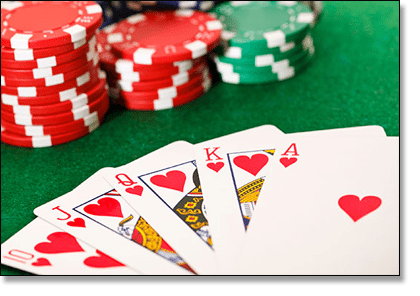 Bet/Raise – Betting refers to putting forward a chosen amount of chips as the first player to do so. Raising refers to matching the previous bet (calling), and then adding additional chips (a bet of higher value) on top of that call. The way each game is dealt will vary significantly depending on the version of poker you are playing. Deals refer to the distribution of cards to each player in accordance with the rules of the game in play. Hole cards are the face-down cards dealt to each individual player. These should not be revealed until the final round of betting has been completed, and cards must be shown to determine the winner. Community cards are the face-up cards placed in the middle of the table and shared by all players. All players use the community cards to create their best hand. Poker against other people – players compete against other competitors around the table, with the aim to beat others with the best hand or cunning tactics. Poker against the dealer – players compete directly against the dealer, rather than each other, with the aim of each player to beat the dealer with a stronger-ranking hand. It’s heads-up v the dealer. Texas Hold’em is the mother of all poker variations and the most common and popular form of poker played today. In this variant, players use two hole cards and five community cards to make up the best-ranking hand possible. Omaha loosely follows the structure of Texas Hold’em, with players using three community cards out of five, and two hole cards out of four to make up the best-ranking hand possible. There are numerous variations of Stud Poker, the most popular variant being Seven Card Stud and Five Card Stud, with the general aim being for players to make the best possible hand using face-up and face-down cards that are dealt throughout the game. Several betting rounds take place per deal. H.O.R.S.E is a combination of five different variations of poker; Texas Hold’em, Omaha, Razz, Seven Card Stud and Eight or Better (the acronyms of which make up the name of the game). During a game of H.O.R.S.E, each round of play rotates between each of these poker game variations. H.O.R.S.E adopts the rules of each of the poker variants mentioned above, so an understanding of each of these games is required. This game is known to be the best way for players to display their genuine poker skills, as players need to be able to demonstrate knowledge and performance over a range of poker variations. This is fast becoming one of pokers most popular variants, and is found at all our endorsed online casinos, as well as land-based casinos around Australia. With a simple structure and fast-paced game-style, 3 card poker stipulates three cards are dealt to each active player, and three cards dealt to the dealer. Players bet an Ante to receive cards, and once they’ve checked their hand, they have the option to place a Play wager if they wish to continue (and think they’ll better the dealer’s hand). Side best such as Pairs Plus are available, too. Players are in competition against the dealer. With so many variations on traditional poker, players have the opportunity to explore different rules and formats to find the game most suited to their personal tastes. When it comes to poker there really is something for everyone, with online variations offering a range of titles, all with great graphics, sounds and live interaction options to keep players entertained for hours – for international players only, of course. Australians can’t legally play online for real money after September 2017 due to the new Interactive Gambling Amendment Bill 2016 now in full effect.